Apps are among the key components that make your iPhone a smartphone. Without apps, your mobile phone experience is not complete. That is why when errors occur on certain apps, you wouldn’t get to like it. Various types of problems can occur to any smartphone applications, whether they’re a third-party or built-in. 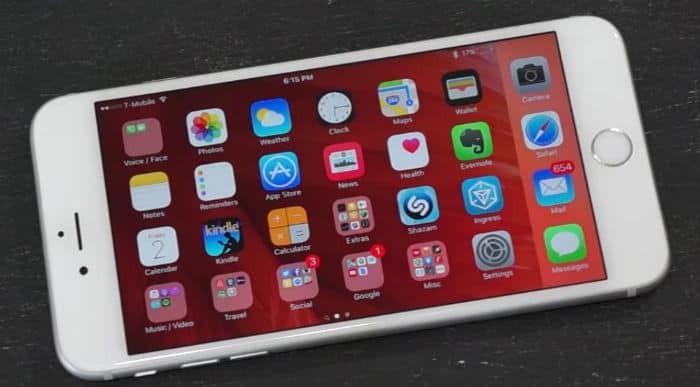 Among the most common issues affecting Apple’s iPhone 6s Plus apps would include apps stuck on waiting, random apps crashes, apps won’t open, and apps not working. There are also a number of iPhone 6s Plus users, complaining about being stuck on the “Slide to Update” error screen. These issues can transpire in both the iOS 10 and prior iOS versions. What triggers these problems to occur on the iPhone apps and how to deal with them? Read on to find out the answers to these questions. If you are experiencing any of these problems and need some help in getting a fix, then this content might be able to help. Some iPhone owners were able to deal with certain apps issues on the same device using any of these methods, so you might as well consider taking your chances. Feel free to try any of the recommended procedures and workarounds outlined through this posting. What can possibly cause apps problems to occur on the iPhone 6s Plus? An app’s behaviour can be affected by various factors at any time. Among the possible culprits include network or server issues, software bug or glitch, memory problems, and worse, hardware problems. Network or server issues – An application may have failed to update due to server issues or network-related problems affecting Apple servers including the App Store. You can likely tell what’s causing the app’s malfunction through error prompts that contain relevant messages or error codes. Among the error prompts depicting a possible network or server issue are “waiting”, “slide to update”, and “app update failed.” So if you happen to see any sort of pop-up warnings while attempting to use certain app and then the app failed to load or do its functions, then you should read and take note of the message or error code because it should serve as a hint for you to fix the problem. Generally, error prompts and codes are designed to let you know of what went wrong and what to work on so as to resolve the underlying cause. Software bug or glitch – Aside from network or server issues, an iPhone app can also malfunction or become erratic due to a bug or software glitch. This can likely be the case if you happen to update the app and the update contains a bug. As a result, the app suddenly becomes erratic as the app gets corrupted. In the case where the app keeps crashing randomly, failed to load or not working at all, you may consider the possibility of corrupted files within the app or the app itself gets corrupted. Memory problems – Insufficient memory on the iPhone 6s Plus can also cause similar symptoms to show while attempting to use certain apps. This is likely the case if your iPhone 6s Plus memory is running low. In this case, what you’re experiencing are possible indications of performance degradation caused by insufficient memory on the iPhone. Hardware damage – Majority of these issues affecting the iPhone 6s Plus applications are software-related. This means that any of these can be rectified or get fixed by the end-user through different workarounds and troubleshooting procedures. Unless hardware damage is present, any of these apps issues can possibly be resolved without taking a trip to an Apple Genius bar. While hardware-related apps problems rarely occur, they can transpire. Software-related problems are possibly fixed with some workarounds. Read on to find out your options to try. How to fix apps errors and problems on the iPhone 6s Plus? The solution may vary depending on the actual cause of the problem. Your chance of getting the problem fixed promptly is higher if you determine the underlying cause beforehand. The best way to find out the possible cause is to consider what has happened prior to the onset of the very first symptom. This means a need for you to answer a questions on “When did the problem start?” and “Is there any changes made before the onset of the problem?” That being said, try to think of what happened or what changes have been made to your device before the problem started. Otherwise, you should consider trying all applicable solutions one by one until the problem is fixed. Be sure to test your device after completing each step to determine if the problem is already fixed. If not, try other possible solutions. Step 1. Restart the erratic app. Minor app glitches randomly occur on an iPhone. And as minor as they are, random apps glitches are usually resolved by performing an app restart. The process involves closing the faulty app and then re-opens it. An app restart can fix any minor glitches or inconsistencies and resumes the app’s normal state. This method is usually helpful in fixing app that keeps crashing or stalls randomly. It is also a potential solution for an app that becomes unresponsive or stops sending and receiving data. For example, emails stop coming through via Email app, Music app stops playing music, or Safari browser freezes or stops loading webpages. Step 2. Reboot (soft reset) your iPhone 6s Plus. If quitting the app won’t fix the problem and the app is still misbehaving or showing errors, the next option you can try is a reboot or soft reset on your iPhone 6s Plus. After it reboots, try to open the app again and see if it’s already working fine. Step 3. Force restart your iPhone 6s Plus. Press and hold the Sleep/Wake button and Home buttons simultaneously for at least 10 seconds. When the Apple logo appears, release both keys at the same time. Wait your iPhone to complete the reboot process and then try to open the app and see if the force restart on your iPhone has fixed the problem. Step 4. Uninstall/re-install the app (if applicable). Some iPhone apps get corrupted especially after installing faulty updates. For apps that can be uninstalled, a possible solution to consider is by uninstalling the erratic application and then re-installing it. This method however will not be applicable to native iOS apps. For network-related apps problems including the ones depicted by the “waiting” status while downloading/installing an app update, try to check your network status. Usually, errors like this can occur due to no stable data network on 3G or LTE. A potential solution is by deleting the app that is currently installing and then re-install it from the App Store again when the network gets stable. To delete a stuck app on your iPhone 6s Plus, hold on the stuck app and when it jiggles, tap the Delete option. It is also possible to get the same error if the App Store server is slow or currently having issues. In this case, you can try accessing the App Store again at a later time. Everything shall resume to normal once the server is up. Alternatively, you can try updating or installing the app via iTunes using the Sync option. You will need a computer with the latest iTunes version if you opt to proceed with this method. Check your iPhone’s current memory status by heading over to General-> Usage. Make sure you’ve got enough free space. Otherwise, remove all unnecessary files and contents so as to free up space on your iPhone. This is likely the problem if you store quite a lot of complex files including music, videos, and other app data on your device. As a result, update or installation processes are hindered. Performance issues are also likely to instigate at this instance. Step 5. Restore to a previous iOS backup. Restoring your iPhone also means losing of data stored in your device. The process will erase current iPhone settings and contents. This can be a potential solution if the problem started after installing the latest iOS update on your iPhone 6s Plus. It’s possible that the update contains a bug or software glitch that might have caused certain app to malfunction. These, along with other post-update issues can possible get fixed by performing an iOS restore or installing a new iOS update containing an official fix to an existing bug. Step 6. Update iOS to the latest version available. Software updates also contain bug fixes. This means that installing this update can likely fix any software malfunctions inflicted by a bug or software glitch on the iPhone. To check for available software update on your iPhone 6s Plus, head over to Settings-> General-> About-> Software Update. If an update is available, follow the onscreen instructions to proceed with iOS update download and installation. Step 7. Reset your iPhone as new. If all else failed to fix the problem, then the next option to consider is a factory reset. This reset erases everything on your iPhone and restores the device to its factory defaults. That being said, this should only be deemed as a last resort. The entire process duration may vary depending on the number of contents on the iPhone. The more contents you’ve stored in your iPhone, the longer the reset could take to complete. Before you proceed with a factory reset, be sure to back up all your important data either through iTunes or iCloud. Also make sure that you sign out of iCloud before you erase your iPhone in iOS 10. Otherwise, your iPhone might be stuck in Activation Lock. To sign out of iCloud, go to Settings-> iCloud-> Sign Out or Settings-> [your name] -> Sign Out. The first method is used for iOS 10.2 or earlier versions, while the second is for iOS 10.3 or later. A factory reset can be carried out either through your iPhone Settings reset menu or using iTunes. Once you’re all set, follow the subsequent steps. To factory reset your iPhone 6s Plus via iPhone settings, go to Settings-> General-> Reset-> Erase All Contents and Settings. Connect your iPhone 6s Plus to your computer using the supplied iPhone cable. Select your iPhone 6s Plus from the list of devices recognized in iTunes. If the problem is not fixed by any of the aforementioned procedures or the app problem persists even after performing a factory reset, then you should now consider contacting your iPhone carrier or Apple Support. At this point, you need to escalate the issue and ask for further assistance and recommendations. Apparently, the problem is already beyond the end-user’s capacity to handle and therefore requires a more advanced troubleshooting approach, which can only be done by an Apple technician.